Now choose a card– left, center, or right. Remember your selection. We’ll return to this at the end of the deck review. 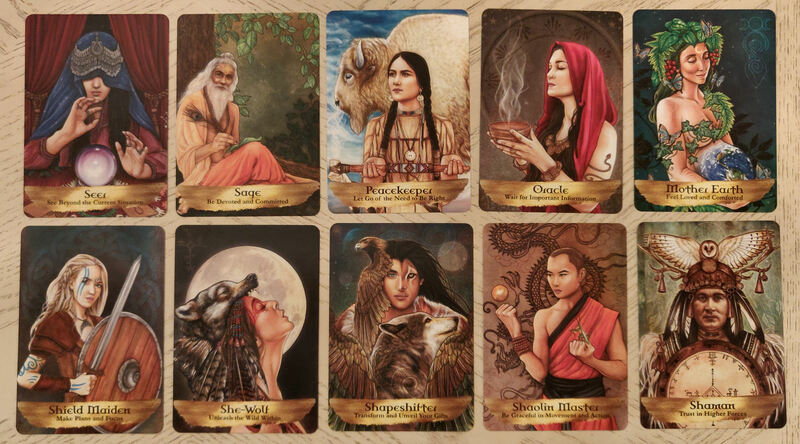 The card you select will represent the spirit guardian who has stepped forth to work with you for the next seven days. What I love most about this oracle deck is its organization. Gray has done a superb job thinking through the system. Unlike a lot of oracle decks now on the market, which is just a haphazard collection of pretty pastel cards with quasi-mystical sounding verbiage, there’s a system here. 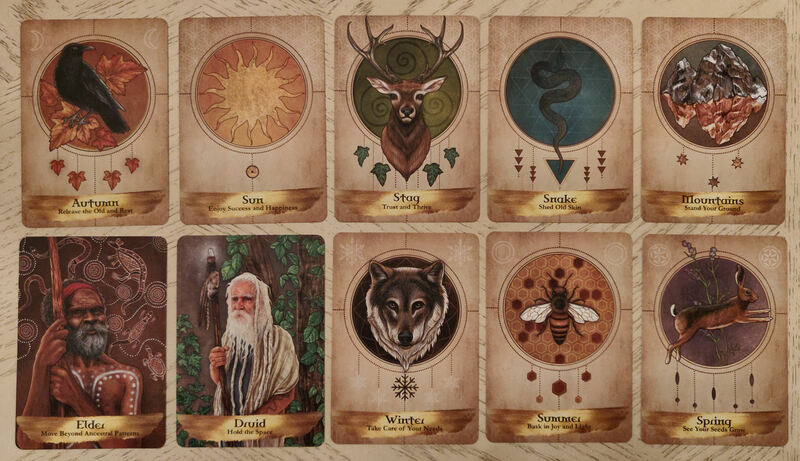 There are four “suits” (for lack of a better term), or four classes of cards: The Sacred Ones, which make up 30 cards, 12 Guardians and Messengers, 9 Warrior Symbols, and 4 cards that are the Seasons. The Sacred Ones are kind of like ascended masters. That’s probably not a good equivalent, but it’s my lay observation. The Guardians and Messengers are angelic beings. Warrior Symbols are universal symbols from the collective unconscious that surface to bring an important message. And finally, the Seasons are about life cycles, changes, and directional flow. 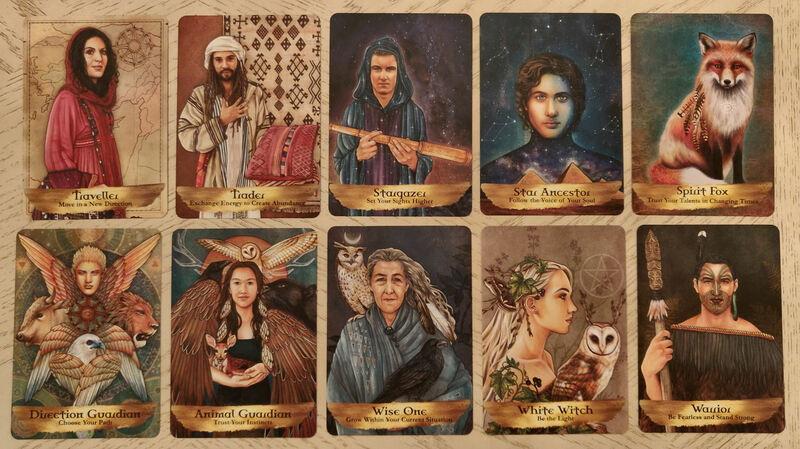 The card you selected reveals the guardian spirit for you to work with, to fully retrieve the messages, lessons, and gifts from this spirit. You can think of this as a mythological personification of something important and relevant to you right now, that was embedded deeply in your own unconscious memory, but is now raised to the surface through the expression of a guardian spirit. Click on the photo to enlarge and read the card entry. Star Ancestor. This is a Sacred One, which I read as an expression of an ascended master. I won’t be interpreting these cards for you, but rather, the card’s corresponding entry in the guidebook is provided. Click on the photo of the card entry for an enlarged view and read the pages for yourself. Knight. This is another Sacred One. I love how the guidebook has a short form Message that is your quick takeaway, and then an About section describing the card, and finally, an Extended Message, which gets more in-depth about how to interpret the card. Protection Guardian. Here, a Guardian/Messenger, or angelic being, has appeared before you. If something has clicked for you here, don’t ignore that feeling. Sit with the message you’ve read and maybe even save the photographic image of the card you selected. Take a few moments each day for the next seven days to connect and attune with this spirit guardian. There’s something here for you and it may be worth your while to lean in to the resonance. 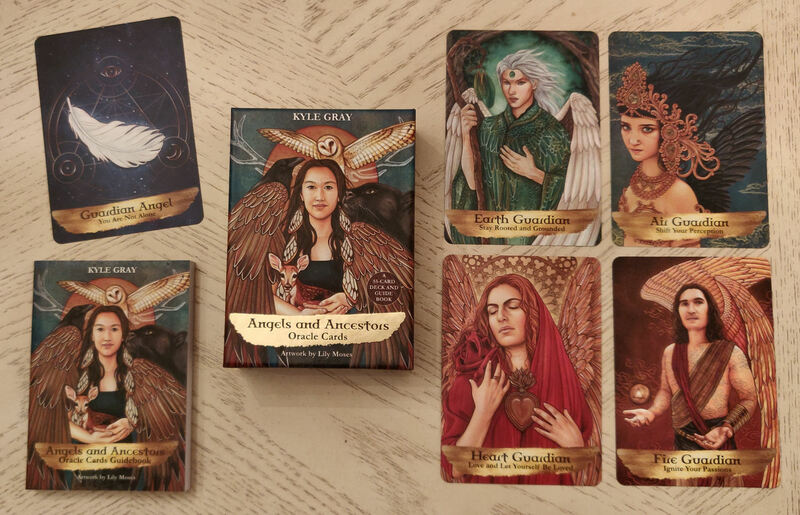 Angels and Ancestors Oracle Cards is a deck that I associate with eclectic Wicca, and maybe even more specifically, American Wicca. Bear in mind that’s coming from someone who does not identify as Wiccan and who probably has no more than a passing knowledge of what “eclectic Wicca” even means. Nonetheless, there you have it. 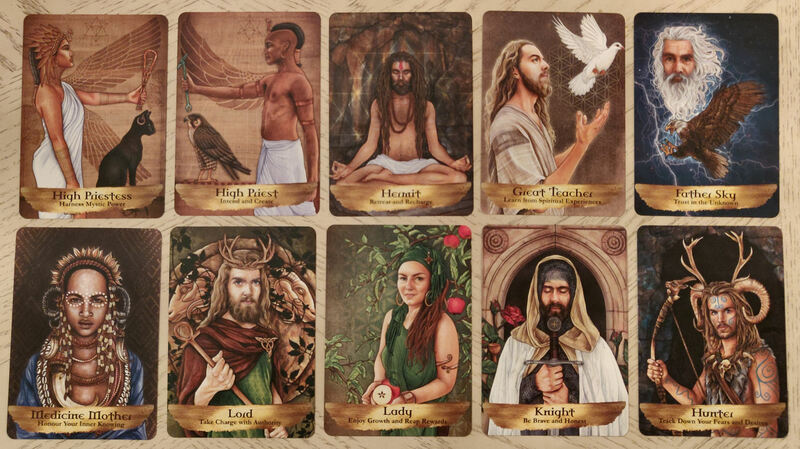 The imagery and concepts in the deck were inspired by Celtic, Native American, Aboriginal, and Earth-based spirituality, according to the product description. I did find it to be a powerful tool and one that taps into mythology to reveal what’s in your own unconscious. Retailing at under $20 U.S. dollars, this deck is well worth your money. From me, it’s a definite Recommend. I’ve been seeing that every time I look at tarot books on Amazon. Thanks for the peek inside. 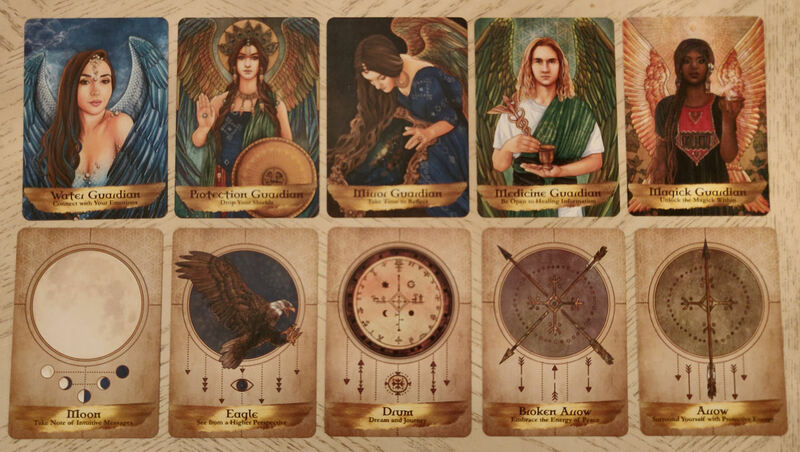 I’m generally not an oracle deck person, but this deck really is beautiful. This deck looks interesting, especially after your review. I’ve added it to my wish list. THanks.